It is an opportunity where you can convey the employer about your skills and how you fit the opening job position. When you write an impeccable personal statement then you’re sure to stand out of the crowd and make a difference. Your personal statement can make your get to the next step of interview. A personal statement can be of three to five lines or 150 words. When you write more lengthy ones then you may be under risk. It is a summary and so it should be concise and short. A personal statement should speak about the candidate, who the candidate is, what he can offer, and his aim in his career. Take a look at the job description and find out the specific skills the recruiter needs and do draft the personal statement accordingly. Usage of tense is another important aspect which judges your vocabulary and English proficiency. Always make sure that the personal statement is written in the first person or third person. It would also be advisable to be consistent throughout the statement. Depending upon the role you’re applying for, the personal statement should vary for each and every job. It is actually a time consuming task, but the more time you spend, chances for getting noticed by the recruiter are high. When you try generic introductions it is merely a waste of time as they are invaluable. When you pen down your personal statement it would be apt if you could focus more on skills and achievement. You can drive away imprecise skills such as communication. Concentration should be more on competencies which include planning, decision making, negotiating, business awareness and time management. Read the statement many times and find if you have to correct, if required make corrections rather than writing incomplete sentences. Read your personal statement loudly and find out if it is perfect. Also ask your friends and colleagues for opinion by showing it to them. Make it a habit about who will be reading your personal statement. Vision your audience in mind and craft your statement accordingly. Remember your job description before writing the statement. The company’s vision and mission statement should be recalled and you should accustom into the company’s culture too. Write down accomplishments that aren’t found anywhere in the application and highlight its importance. Also make a point about how those achievements would be useful to the employer and organization. Include all your skills and pen them down. 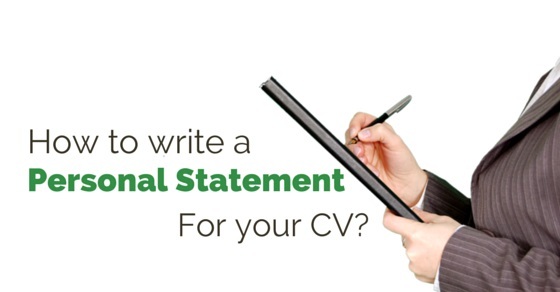 Hold in mind to address personal statement by answering any queries the employer asks. Make sure to offer specific as well as detailed ones. Be exact in whatever information you put down in your personal statement. When a personal statement is modulated, it is important to offer an optimistic view and provide strongest points so that your resume stands out of the rest. Your current employment situation should be mentioned in your opening statement. Your current role should be mentioned and the recruiter should be able to see it. It could be anything, whether you left from college, or in a job role in any concern. Buzzwords can be beneficial for online profiles, but they are not a perfect way to add to your CV. It would seem as if your copying terms read somewhere. It would be good to avert words like ‘result-oriented’, ‘team player’, ‘extensive experience’, ‘proven track record’ and more. When started to write a personal statement, make sure you do not use radical or humor statement. Alan Carlile head of university of Sheffield mentions that it is important to focus on opening statement and care should be taken to write a personal statement. Recruiters come across several resumes and so your personal statement in your resume should be attention grabbing and capturing. So take proper care in writing your personal statement and make it stand out from the rest. Creativity is something which is enjoyed and encouraged in all fields but showing off too much creativity in personal statement can be avoided. As creativity may cause a negative impact on your resume. Personal statements are a way of communicating your greatness in a professional way. It offers a deep insight about who you are and the reason for hiring you. Apart from job application, a personal statement highlights some special achievements not found on the job application. The above said tips can be utilized for formulating personal statement and can offer you more opportunities to get noticed by the recruiters. Run through the sites and get to know various examples posted for writing a personal statement. Take initiatives to read through all the tips and formulate your special personal statement so that you highlight amongst the rest. Previous articleHow to Make a Good Impression on the First day?